Screen printing is an ancient, reliable, and effective technology for printing on different types of materials. This technology has established itself as one of the best printing solutions by adapting with the age by time to time modification and user satisfaction. Let’s see the reasons for which screen printing machine is termed as one of the best versatile printing equipment. In the market, there are many models of screen printing machines of the different brands of the different price range. Some are of low price and best suited for beginners. Screen printing machines of moderate price range are very suitable for medium level entrepreneurs. High price screen printing machines are provided with advanced user interfaces for professional application. They are best suited for precise performance and best quality output. 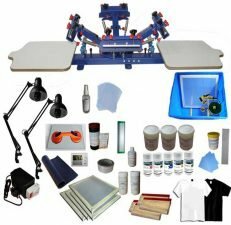 For example, Superland 4 color 4 stations screen printing press costs $309.99, Maxwolf 4 color 2 stations screen printing press costs $215.39, and Ridegeyard 4 color 1 station screen printing press costs $152.99. It is possible to print any design of any color of any thickness with a screen printing machine. It empowers the users to choose the machine model and brand as per their requirement. Every brand has some exclusive features as well as some limitations. For example, Superland 4 color 4 station screen printing press can hold four screen plates at a time so that four color overprinting may be achieved. On the other hand, 4 color 1 station screen printing press can handle single screen printing only. But, they are popular among users with a limited budget and intended to perform simple tasks. Almost all screen printing machines of the market have an all-metal construction with advanced electrostatic spraying and electroplating. Its durable construction using the latest technology and material ensures longevity for many years. So, users need not worry about re-purchasing. Simple maintenance is enough to keep a screen printing machine in a perfect running condition for years. In addition to that electroplating ensures no rust generation. So, advanced level durability is one of the factors which made this screen printing equipment versatile. Screen printers are capable of handling different types of materials very perfectly. It is possible to achieve high-quality printing on materials like glass, wood, fabric, or metal with any screen printing machine. Image of the texture of different colors may be printed on any surface. For example, Superland 4 color 4 stations screen printing press is very efficient for performing flat printing. To print efficiently on all types of frames, it is needed to have the capacity of handling frames of different size and weight. With the change of frame size, weight also changes and thus the question of maintaining the balance of weight arises. Screen printing machines are equipped with adjustable double spring device to handle the frames of different weight. It has a supporting device to maintain the balance and stability of the screen printing machine during its operation. Most of the screen printing machines of the market are carefully designed to occupy the minimum space. In a word, screen printing machines are space efficient. They can be placed in a very limited space. Its operation and maintenance do not require a large amount of space. Vevor 4 color 1 station screen printing press has table type combinatorial design which is space saving. But, if you do not have such limitation related to space then you may opt for a free-standing type screen printing machine which is durable in nature and can perform more time than a tabletop type machine. Screen printing machines are designed to perform over the years. They are durable due to their careful design and construction. In addition to that, screen printing machines require a minimum level of maintenance. Screen printing requires materials like inks, chemicals, screens etc. which make the workplace dirty. A careful arrangement may reduce this. But, the screen printing machine itself does not require a major maintenance except periodical cleaning and washing. Its maintenance is not very easy too. Most screen printing press runs for many years without creating any hassle to the users. So, we can term a screen printing machine maintenance friendly in terms of easy maintenance and maintenance requirement. Sometimes, single color printing is required and sometimes multiple color printing is needed. No matter how many colors are needed to be printed screen printing machine is expert here. They can handle colors from 4 to 8. For example, 4 color 4 station screen printing machines are equipped with 4 station and have the capability of printing 4 colors. Not only the number of colors, screen printing machines can handle different amounts of tasks. For slow pace printing, printing machines with a number of stations are good. But, if you need to meet a production deadline with a large volume of printing task, without any hesitation take a screen printing press with multi-station and multi-color. So, Scree printing machines are suitable for handling any volume of the task. No matter it is small or large, screen printers are perfect for any. You may need to imprint an image or texture on a surface. The surface may be of a t-shirt or of other material. No matter the surface is, a screen printing machine assures of providing a quality output. To achieve a high-quality printing you need to select an image with a high resolution, suitable chemical, screen, and a screen printing machine. For output, you need not worry. Of course, it is a high-quality and lively printing. Screen printing machine is famous worldwide. For the above reasons, it is unanimously established that it is a versatile printing equipment. For a perfect output, cost-effectiveness, or tricky design, screen printing machine made its place as one of the most discussed and used printing equipment in the world history of printing. And it happened due to its versatility. It is not a myth. Today, it is an established truth.